They’re big! They’re flouncy! They’re fun! But how do you make a bustle? Get ready for Cogs & Corsets by making your own bustle from a tablecloth! In just a couple hours, you will have a two-tiered bustle made with simple materials from a thrift store or around the house. Participants are encouraged to bring their own round or oval tablecloth (ideally 72″ diameter or larger for an adult), or one can be purchased at the workshop — all other materials will be supplied. Participants can bring their own sewing kit if they have one. Workshop is limited to 15 participants (registration required) ages 12 and up. • pick a color that will match your outfit! 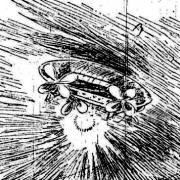 On the dark and rainy night of November 17, 1896, hundreds of witnesses reported a dirigible in the skies above Sacramento, California. Thus began the series of thousands of sightings over the next six months from the Pacific Ocean to the Mississippi River, from Milwaukee, Wisconsin to Galveston, Texas. Hoax? Mass hysteria? Aliens? Or did a secret inventor beat Count Ferdinand von Zeppelin and the Wright Brothers into the skies? Prof. Pike is a gentleman adventurer, mercenary explorer, dime novel hero, and veteran of the late unpleasantness. After serving in the US Aeroship Cavalry and as special agent to the President, Pike left government service to travel the world. When not saving civilization as we know it from science pirates, abominations of nature, and invaders from the beyond, Professor Vitruvius occasionally lectures on topics of interest in history, science, and technology. Spiritualism is a rich part of the history of the small McLean County town of Le Roy, Illinois. James T. and Elizabeth J. Crumbaugh built a monument to the lasting communication between this world and the next. Learn how Spiritualism changed their lives forever. Rev. Nancy S Ryall, RN, BSN, OM, CM has been a practicing Spiritualist for 45 years. She carries credentials as an ordained minister and certified medium from the National Association of Spiritualist Churches (NSAC). She is an active member of the International Spiritualist Federation and acts as the editor of their newsletter Yours Fraternally and as the membership representative for the eastern portion of the United States. She is former Pastor of Spiritualist Chapel in the Woods and Director of Cherry Valley Spiritualist Camp in Illinois. Ryall is experienced in all forms of mediumship, but has a special love for trance. She teaches workshops in trance, manifestation, healing, meditation, and many other topics. She also teaches online classes. Her website is linkwithspirit.com where you can see an example of her trance mediumship. 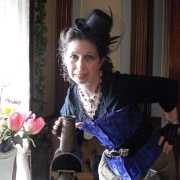 This hands-on, how-to class will show participants how to use items from resale shops to create steampunk costumes. 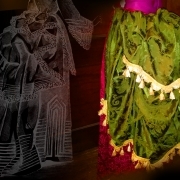 During the session, you will be able to assemble creative costume pieces. Some materials will be provided, but feel free to bring your own thrift store finds. Clatie Fischer has been sewing since she was a young girl, when she first began making something out of nothing. She majored in Apparel Design at Illinois State University, and has worked in the costume departments at Lincoln College and ISU. Fischer also worked costume crew for the Illinois Shakespeare Festival. She has most recently been working with Heartland Theatre Company. This fast-paced, entertaining, interactive, and informative session will explore anachronistic make-up techniques relating to different face shapes, eye shapes, and skin types. Attendees will also receive information on color selection so the best in each and every face can be brought out. With over 35 years of theater experience including hair and makeup design, Bil Deck has both a passion and a knack for unique communication that is entertaining as well as informative. He is a professional makeup artist with an education background and has consulted with entertainers and business owners on their promotional makeup and photography. He has also worked extensively with Chamber Steam Pop recording artist Michelle Deck on makeup, hair, and fashions for her CD cover, promotional photos, and live performances. Ever wondered how to brew the perfect pot of tea? Ever wonder where tea comes from and how it’s manufactured? Well, that is what we will discuss: the tea plant, how it is processed, and how to make it into a great brew! A naturalist and nature illustrator, Professor Octavia Quinlan has been traveling the world looking for odd specimens of flora and fauna, and on the way has also accumulated a storehouse of knowledge on the tea customs of other lands. She enjoys talking about any of these topics, from anteaters to yapoks, from Assam tea to oolong, and anything else under the sun (but the weirder, the better). Torii L. Thompson is a practitioner of assemblage and also informed from a theoretical perspective. She has recently won the Gallery Choice Gold Award at the Women’s Work 2019 show for an assemblage piece, and her work has been seen in many shows over the last several years including the St. Louis Artists’ Guild (Women’s Work 2017), The Arts Illiana Gallery (Second Juried Exhibition 2016), and Hoogland Center for the Arts (Springfield 2016). Examples of her work can also be seen in a variety of local businesses including Bloomington Audiology (Time is Relative), and Highland Veterinary Clinic (Fish Joy, Requiem for a Shed, and SPD). 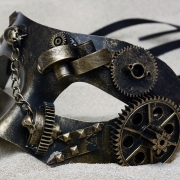 Ever imagine what it would be like to write your own speculative story with a steampunk spin? What about a steampunk sonnet? Then this workshop might be just the place to oil your creative cogs and get you started! We’ll cover some basic dos and don’ts of creative writing in general and steampunk literary style in particular, as well as play with some prompts — who knows, you may just be the next H.G. Wells or Jules Verne! Ardis Stewart teaches English composition, humanities, literature, and classical mythology at Heartland Community College and Illinois Central College. Her poetry has been published in Seeding the Snow, RHINO, Word-River, the McLean County Barn Quilt Heritage Trail booklet and website, on WGLT’s Poetry Radio, and in the anthology Where We Live: Illinois Poets. You can also find her (often in historical costume), volunteering for the David Davis Mansion State Historic Site in Bloomington, Illinois, and dancing. P.T. Barnum was the “Prince of Humbug,” but he never once claimed that the lies he was presenting were anything other than pure entertainment. Plenty of other people, however, were not so reputable and the hoaxes they promulgated continue to this day. Rev. Nancy Ryall will give a demonstration of mediumship and connection of loved ones who have passed over. Not everyone will get a reading, but hopefully everyone will have the opportunity to witness Spirit working. This workshop will teach participants how to take different mixed media pieces and turn them into a one-of-a-kind necklace of their own. All materials needed will be provided. Blaine Kemp is owner and designer of Steam Pop Creations (steampopcreations.com) and has been in business for more than six years, specializing in steampunk assemblage, and vintage and antique jewelry remastering. His goal is to mix the old with the new to create unique and interesting jewelry. We all know that we live on the Earth’s rocky surface with the interior a molten inferno. Or do we? 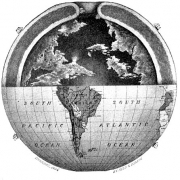 What would you say if I told you the Earth was a series of hollow concentric spheres? Or that we were living on the inside of a hollow sphere? Delusional? Oh, yes. But why should we let that stop us? 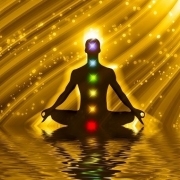 Learn about your own energy field and what you can do with it. You will get hands-on experience in feeling and reading it. Rev. Nancy S Ryall, RN, BSN, OM, CM has been a practicing Spiritualist for 45 years. She carries credentials as an ordained minister and certified medium from the National Association of Spiritualist Churches (NSAC). She is an active member of the International Spiritualist Federation and acts as the editor of their newsletter Yours Fraternally and as the membership representative for the eastern portion of the United States. 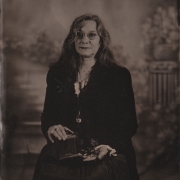 She is former Pastor of Spiritualist Chapel in the Woods and Director of Cherry Valley Spiritualist Camp in Illinois. Ryall is experienced in all forms of mediumship, but has a special love for trance. She teaches workshops in trance, manifestation, healing, meditation, and many other topics. Are you confused between a four-in-hand and a Kelvin? Do you think a half-Windsor is a wrestling move? This hands-on workshop will explore knots in men’s neckwear from the simple to extraordinary. 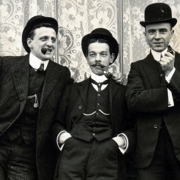 A brief history of neckwear will be reviewed and then we’ll dive in making knots. Participants are welcome to bring their own ties or cravats to practice with, but neckties will be provided. Cathy Sutliff has been involved in making period costumes since high school and briefly owned her own costume shop that featured vintage and reproduction garments. Inspiration to dive into men’s neckwear was spurred on by her husband’s personal collection of neckties numbering over a thousand pieces. Cogs & Corsets: Going Forward! This is a chance for a little feedback! Members of the Cogs & Corsets planning committee will be talking about future ideas for the event, and would appreciate your input. Let us know what you liked about the festival and what we could do better. This is your opportunity to make Cogs & Corsets even more spectacular for 2020. Hands-on workshop to create unique head gear appropriate for your favorite festival. Participants will have the choice of making a traditional flower crown or one “geared” toward Cogs & Corsets. Julie Johnson and Emily Anderson are florists and decorators at Casey’s Garden Shop & Florist in Bloomington. This session will take a look back on the formation of the Steampunk genre, its present state, and beyond. 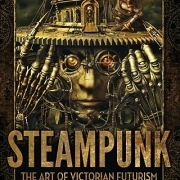 Following a folding timeline that begins on June 14, 1822, and working our way through the 19th, 20th, and 21st centuries, we shall explore how Steampunk has evolved from a literary sub-genre into a fully-realized community of eccentrics and dreamers intent on riding their airships into the future that never was. 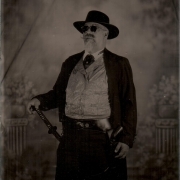 Aloysius Fox has been an active member of the Steampunk Community since 2008, founding various Steampunk events such as the Steampunk Symposium and the Chicago Steampunk Exposition; and various Midwest Steampunk organizations in Ohio, Indiana, Kentucky, and now Illinois. In his travels through time and space, Aloysius has learned a thing or two, and is always happy to share this knowledge. An inventive approach to the display of air plants! Participants will make their own steampunk-themed air plant invention to take home with them. Is there no local Steampunk scene where you live? THEN START ONE! 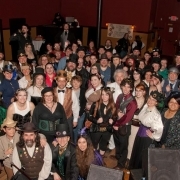 Join us for a guided discussion on how to form your own local Airship (or Steampunk society) and build up an active Steampunk community in your town. We will look at various groups from a number of states across the Midwest and analyze what practices led to their successes. During this workshop we will create accessories that can enhance your costume and inspire the development of your Steampunk character. We will use various items including hardware store buys and thrift store findings. Do you have a special talent that could be taught? Do you have Steampunk-relevant knowledge to share with the world? Are you a historian that can give us a glimpse into the history that inspires Steampunk? Or perhaps you’re a Maker who could share your skills, tips and tricks? We’re looking for presenters for 50-minute workshops, panels, and presentations. These will be occurring throughout the weekend, Saturday, June 8 and Sunday, June 9. Fill out the presenter request form!